Because the lame-duck session of the Michigan Legislature will conclude at some point past my deadline, I didn’t feel confident in commenting directly on what legislation will actually pass. Further, I have no idea what Governor Snyder may sign into law and what he may not. 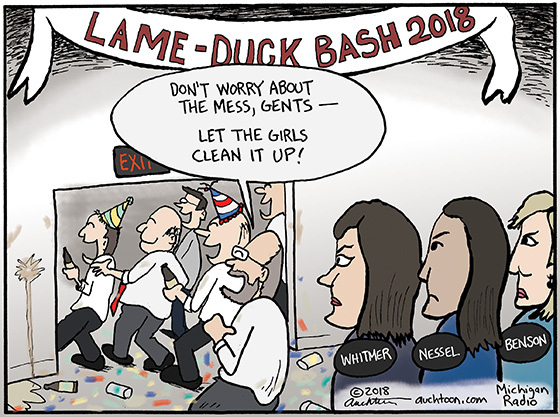 So I decided to go with what I do know as generally true: Men make messes, women clean them up. However this particular mess eventually gets sorted out, I wish you all a happy and peaceful holiday season. I look forward to marveling with you over a whole new set of Michigan shenanigans in the coming year. On Wednesday this week, Governor Snyder signed a bill into law that will allow a tunnel for a new section of pipeline under the Straits of Mackinac to move forward. The intention is to resolve the status of the Embridge Line 5 oil pipeline, which currently is laid across the bottom the Straights and poses a potential for catastrophic disaster. Snyder for some time has been negotiating with Embridge and other interests for a deal to keep the pipeline open. It’s a complicated set of environmental, economic, logistic, and (you guessed it) political issues. But it was mostly political that a bill was generated and fast-tracked to Snyder’s desk before the end of his term — an incoming governor Gretchen Whitmer almost certainly would not sign it. 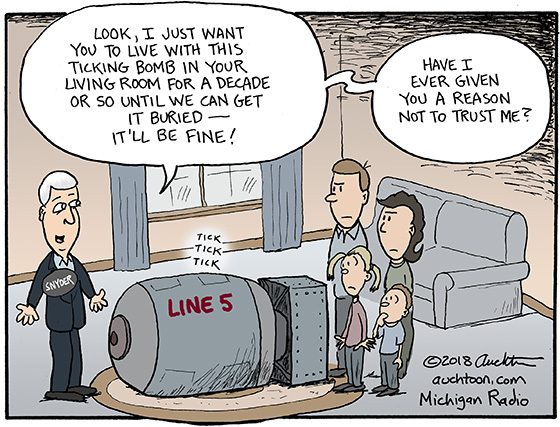 For a number of reasons: Line 5 keeps operating as is for a decade or more while the tunnel is constructed. The questionable wisdom of making a huge infrastructure commitment to carbon-based energy. The trustworthiness of a health and safety issue involving Michigan water and Rick Snyder. In any case, it’s not quite a done deal. There will be challenges to the tunnel and perhaps additional legislation. It may all work out fine. By the time it gets built (and fresh water becomes increasingly precious), Mackinaw City/St. Ignace might develop into a major metropolitan area that could use a tunnel for a subway link. It was hard not to notice the stark contrast this week between events celebrating the late President George H.W. 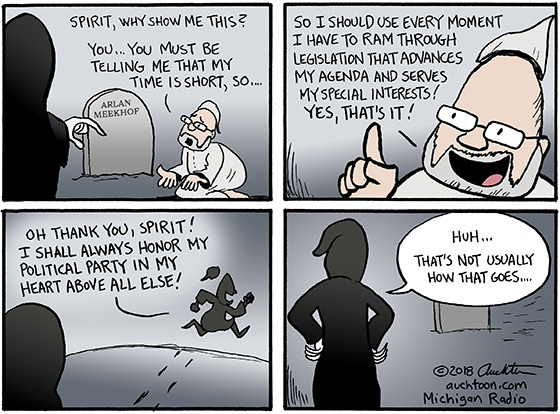 Bush’s life and the shameless actions of the Michigan (and Wisconsin) lame duck legislatures. Bush Themes: Civility, democracy, respect for the office, doing what’s right, sacrifice, generosity, graciousness, honor, duty, trust the system, serve the people, country first. Michigan Legislature Themes: Grab and cling to power, the end justifies the means, the people have spoken (but I know better), duplicity, greed, game the system, serve the special interests, political party first. It’s as if a Dickensian story was being played out live in front of all of us, and the likes of Senate Majority Leader Arlan Meekhof completely missed the point. Maybe a visit from the Ghost of Christmas Future would save them. Or maybe they’re the Jacob Marley’s who will wear the chains they are forging in life.